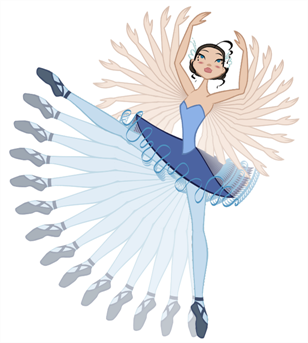 Harmony provides some great tools for animating cut-out character models. 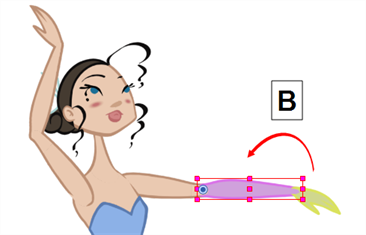 You can simply animate a character by using the Transform tool to move the drawings and pegs that constitute its cut-out model. 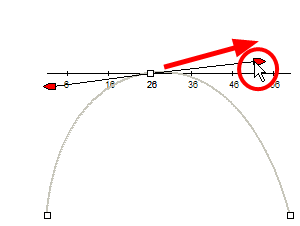 With animated keyframes, basic interpolations are automatically done by Harmony. 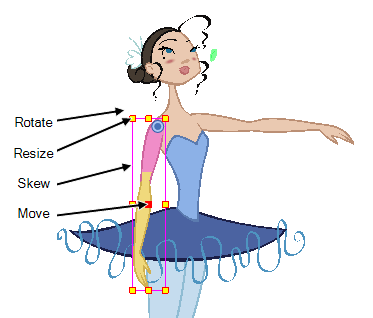 The timing of the movement can be adjusted to make life-like motion, and drawings can be swapped at any point during interpolations, allowing to combine movement and drawing changes to create frame-perfect cut-out animations. 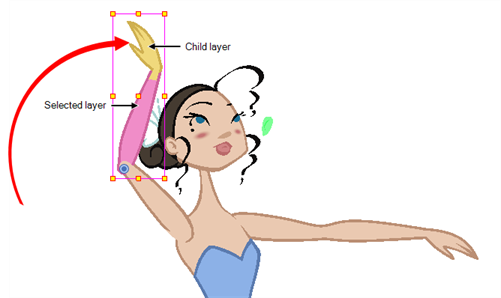 We will create a simple cut-out animation by making your character's first pose on the first frame, its second pose on a later frame, and letting Harmony interpolate them. In the Timeline view, collapse your character using the Expand/Collapse arrow. Select the first frame of the scene. 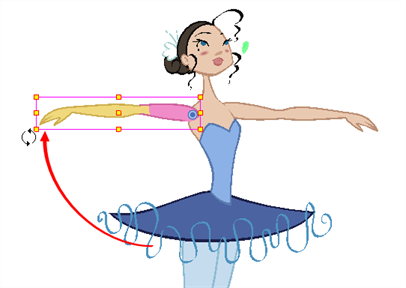 A keyframe is added on the current frame. 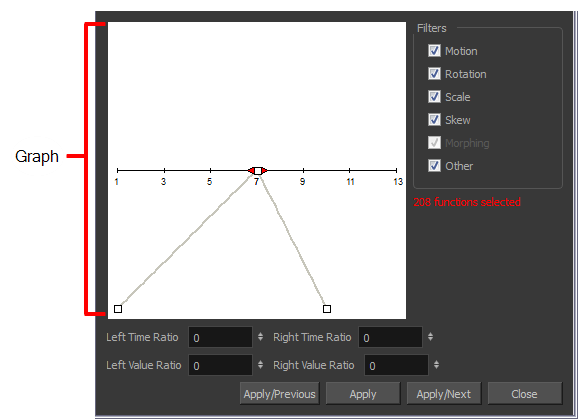 Use the Transform tool to rotate, skew, scale or translate the selection to its new position. Repeat for other parts of your character model until you have your first pose. In the Timeline view, select the frame where you want to have your second pose. In the Camera view, change your character's pose again. 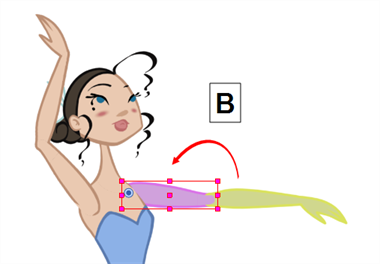 Repeat this process for all the poses you wish to add to your animation. NOTE: If a range containing multiple keyframes is selected, only the first selected keyframe will be affected by the Seat Ease for Multiple Parameters functionality. Since cut-out animation often involves complex models with hierarchies, learning shortcuts to easily navigate between layers can save a lot of time. One very useful trick to learn is the Center on Selection keyboard shortcut. This shortcut allows you to navigate directly to the selected layer in the Timeline view. Hence, you can use the Camera view to visually select the layer you wish to animate, then use the Center on Selection shortcut to find the layer in the Timeline view, instead of going through your layer's list to locate it. In the Timeline view, collapse all your layers. In the Camera view, select any layer, preferably one that is deep in your character model's hierarchy. Click on the Timeline view's tab, or anywhere in the Timeline view that will not change your selection. This is because the shortcut works if the Timeline view is focused on. The Timeline view is now focused on the selected layer, and all its parents have been automatically expanded. This shortcut can also be used in the Node view. If your selection is inside a group, it will navigate to the inside of this group and the center the Node view on the selected node. If you want to use this shortcut frequently, you might find that having to click on the Timeline or Node view every time is tedious. To remedy this, you can enable the Focus On Mouse Enter preference. This will set the focus on a view as soon as your mouse cursor enters it, instantly making all of this view's keyboard shortcuts functional. In the Options section, check the Focus On Mouse Enter check box. Keyboard shortcuts for specific views will now work as soon as your mouse cursor enters the intended view. Otherwise, Harmony also features keyboard shortcuts to quickly change your selection from the currently selected layer to its parent, child, or to one of its siblings, allowing you to quickly navigate your character's hierarchy from one layer to one of its related layers. From the top menu, select Animation > Select Parent or press B to select the parent layer. Select Animation > Select Child or press Shift + B to select the child layer or Animation > Select Children to select all child layers at the same time. To select the previous sibling in the family, press /. To select the next sibling in the family, press the question mark (?) key.